• From Beloit (north): Follow I-90 East (portions toll) to the East State Street exit (East Business U.S. 20) and follow it for about seven miles into downtown Rockford. Cross the Rock River and take a left at Church Street, which will be the second light. Look for the BMO Harris Bank Center on the left side of the street. 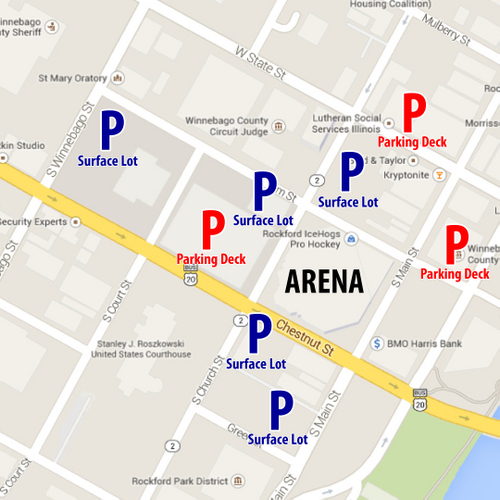 Parking is available in the deck opposite the BMO Harris Bank Center. • Alternate route: Take Ill. 2 (North Main Street) south into Rockford. Follow Ill. 2 into downtown Rockford when it becomes a one-way street on Church Street. The BMO Harris Bank Center is on the left side of Church Street. 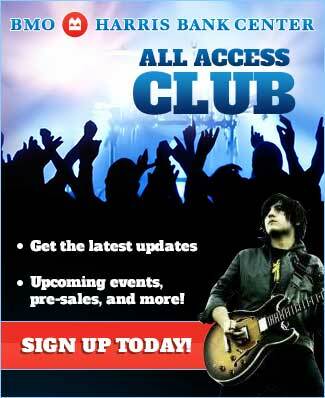 Parking is available in the deck opposite the BMO Harris Bank Center. • From Freeport (west): From U.S. 20, follow Business U.S. 20 (West State Street) into Rockford. Turn right on Church Street and look for the BMO Harris Bank Center on the left side of the street. Parking is available in the deck opposite the BMO Harris Bank Center. • From the Chicago area (east): Follow I-90 West (Northwest Tollway) to Bypass U.S. 20 West (towards Freeport). Follow the U.S. 20 for about seven miles to the North Main Street exit. Once you reach downtown Rockford, turn left on West State Street and left again on Church Street. Parking is available in the deck opposite the BMO Harris Bank Center. • From Rochelle (south): Take Ill. 251 (11th Street) north into Rockford. Turn left on Charles Street, which will become Jefferson Street. Cross the Rock River and turn left on Church Street in two blocks. Parking is available in the deck opposite the BMO Harris Bank Center. Parking fees are determined by the city of Rockford in conjunction with ABM Parking & Transportation Services.